Trump returns home to New York City amid protests, chants of "shame"
NEW YORK -- President Trump went home to Trump Tower on Monday for the first time since his inauguration, with a throng of chanting protesters awaiting -- but never seeing -- him. 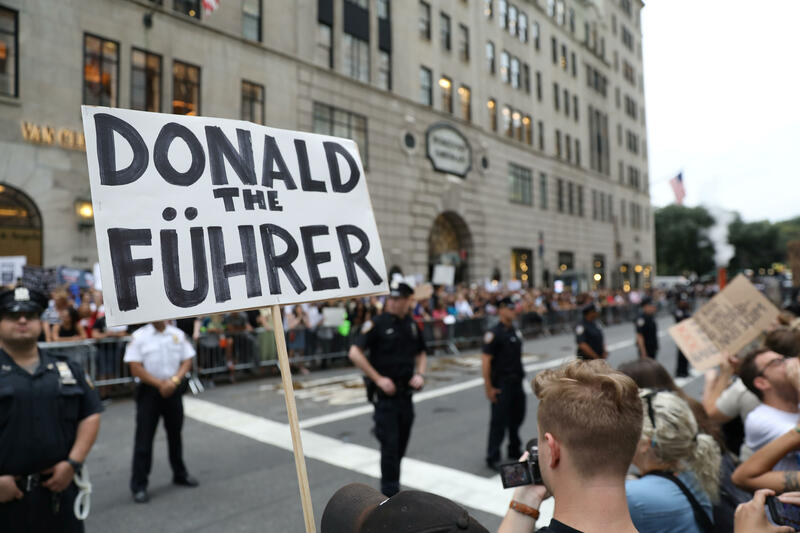 Thousands of demonstrators roared "shame, shame, shame" and "not my president!" while awaiting Mr. Trump's motorcade along Manhattan's Fifth Avenue, but it ultimately approached from another direction. A far smaller crowd of Mr. Trump supporters also awaited him. CBS New York reports that at least two protesters were arrested Monday night, according to the New York Police Department (NYPD). By the tower, some protesters carried signs with such messages as "impeach" and "the White House is no place for white supremacy" as chants including "love, not hate -- that's what makes America great" and "New York hates you!" echoed off the surrounding buildings. Nearby, an inflatable, rat-like caricature of Mr. Trump stood by The Plaza hotel. The Rev. Jan Powell, a retired minister of the United Church of Christ, carried a sign that read "no justice, no peace" as she stood opposite Trump Tower. She said she was bothered by the Republican president's response to the white supremacist rally that descended into violence Saturday in Virginia. But "what bothers me the most is when folks like Trump try to silence our First Amendment right to free speech, either with violence or 'fake news' or hate speech," Powell said. Still, she said, "I pray for him every day. We are both human beings." Meanwhile, about two dozen Mr. Trump fans were in a separate pen near The Plaza, chanting "God bless President Trump" and carrying American flags and signs with such sentiments as "now is not the time for divisiveness." "Though we may be small in this bubble, they need to know we're here," said Shaun Jackson, a tax attorney who sees Mr. Trump as a populist shaking up Washington's elite and the protesters as ignorant people with "a lot of hate." "They'll call me a Nazi, but do you know that you're acting like a Nazi by telling me to get off the street?" he said. With supporters and anti-Trump demonstrators penned across the sidewalk, both sides yelled at each other, "Go home!" A block south of Mr. Trump Tower, police officers with bullhorns confronted protesters pressing against and straining the barricades, telling the demonstrators to step back. Metal police barricades were up well ahead of time on Fifth Avenue and Mayor Bill de Blasio urged drivers to avoid the area around Trump Tower. In addition to metal fencing there were concrete barriers, and sanitation trucks filled with sand lined up on Fifth Ave in front of Tiffany's and Gucci, CBS New York reports. After Mr. Trump was elected president, security around the tower ramped up dramatically. Barricades and checkpoints were manned by scores of uniformed police officers. Mr. Trump, a native New Yorker, said Friday that he had stayed away because he realized the impact of the street closings and other aspects of a presidential visit. "I would love to go to my home in Mr. Trump Tower, but it's very, very disruptive to do," he said. CBS New York adds that the NYPD were well-prepared for Mr. Trump's visit. "The NYPD has proven clearly in the time up to the inauguration their ability to secure the president and his family, his team while keeping things moving in the surrounding neighborhood," said de Blasio, who begins a weeklong vacation in Rhode Island Monday. Protester Gabby Parra, however, said she was demonstrating to show Mr. Trump "he's not welcome here." "We need to let him know that New Yorkers and people from around here are not going to accept his blatant idiocy," said Parra, a 17-year-old high school senior from Teaneck, New Jersey. She said she feels the president dehumanizes minorities, noting that he launched his campaign by portraying Mexico as a source of rapists and murderers coming into the U.S. and that he initially failed to denounce white supremacists specifically after Saturday's violence. Mr. Trump, under pressure after initially condemning what he called an "egregious display of hatred, bigotry and violence on many sides, on many sides," on Monday declared that "racism is evil" and described members of the Ku Klux Klan, neo-Nazis and white supremacists who take part in violence as "criminals and thugs."